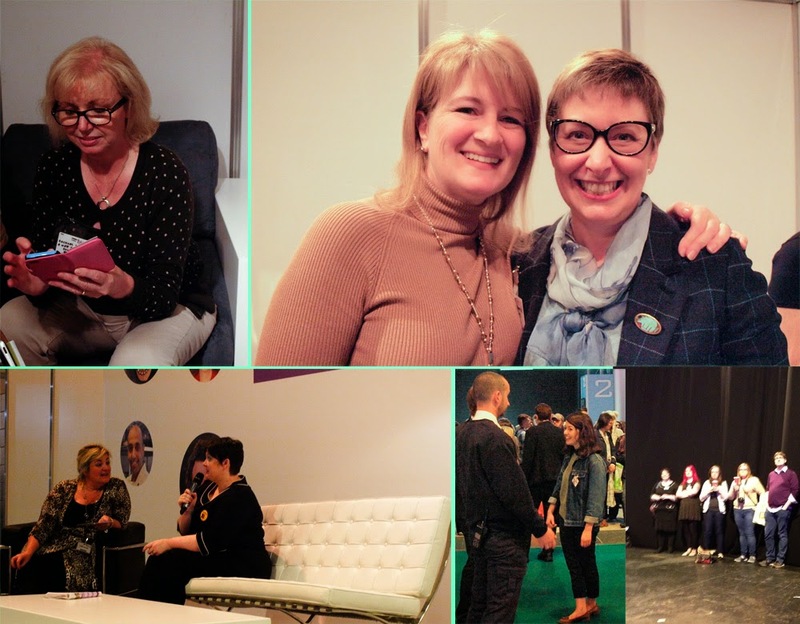 It's time for another monthly round up of products that I've been sent to review, it's always interesting to try something different or revisit an old friend, I hope you will find it useful to read my comments too. I've loved Jordans Original Crunchy since it was first launched in the 1970s, It was always a real treat and not something we could afford to eat every day. 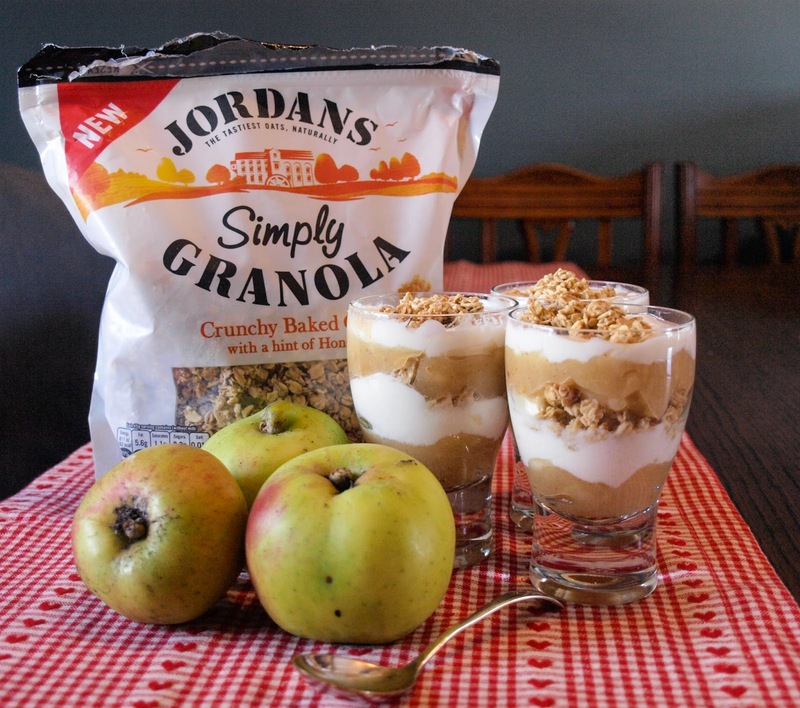 Jordan's now have a whole range of cereals and they have just launched Jordans Simply Granola, a simple blend of crunchy baked oats with a hint of honey. Simply Granola contains no artificial additives or flavouring and its oats are source from Nature Friendly Farmesr where Jordans' cereal farmers devote at least 10% of their fields to supporting wildlife. 3 cooking apples, peeled and chopped. 1. Cook the apples with the sugar and a little water until they have cooked down, leave to cool. 2. Once the apples have cooled, layer the cooked apples, natural yogurt and granola in 3 glasses, ending with a sprinkle of granola. We ate this as dessert but, as it isn't too sweet, it would also be nice for breakfast. Well, Halloween is upon us and that means that, if you haven't started already, then you are probably going to be starting to think about Christmas. Ferrero Rocher have come up with some fun novelty versions of their famous chocolates as well as the usual boxes. 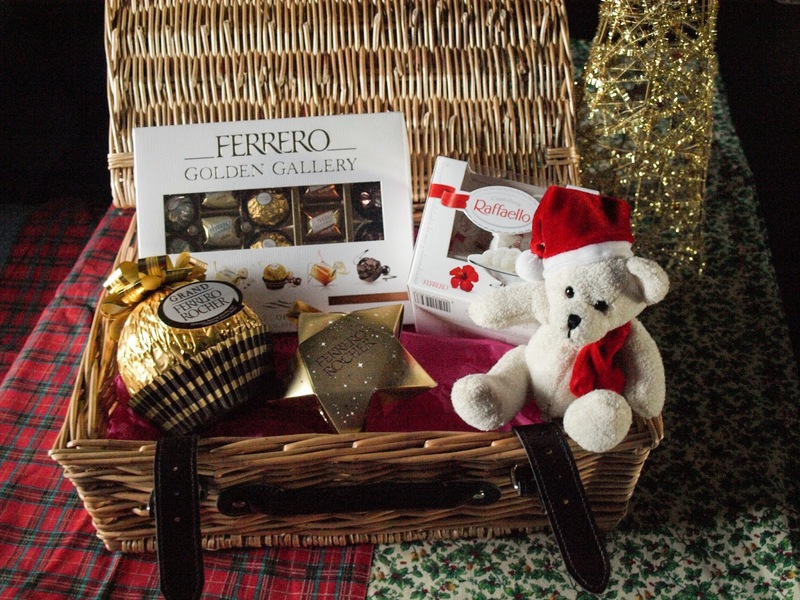 I think the Grand Ferrero Rocher is a genius idea and a great gift for a fan of the crunchy, chocolate and nut confectionery. 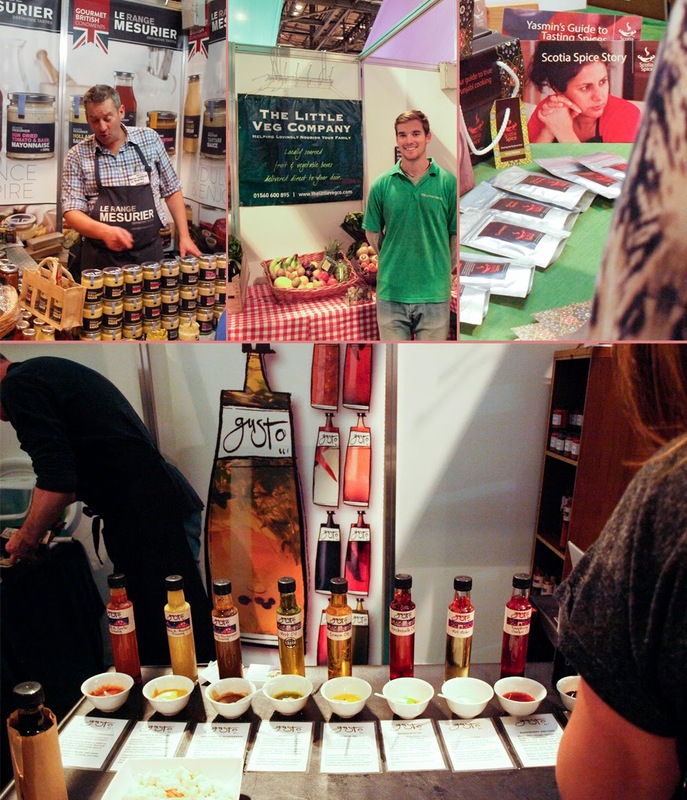 Proper Tomato Sauce was one of the products in my goodie bag from the BBC Good Food Show Scotland. 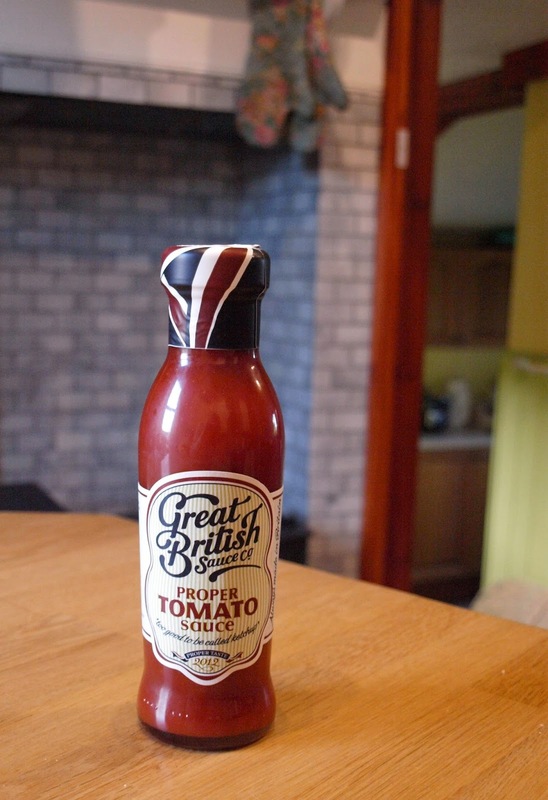 It's made by the Great British Sauce Co who describe it as delicately seasoned and blended with carefully selected ingredients. Bursting with fresh tomato flavour. Most of us are familiar with Heinz Tomato Ketchup, this sauce is less astringent and has a sweeter and milder flavour, like a tomato sauce you would make yourself at home. 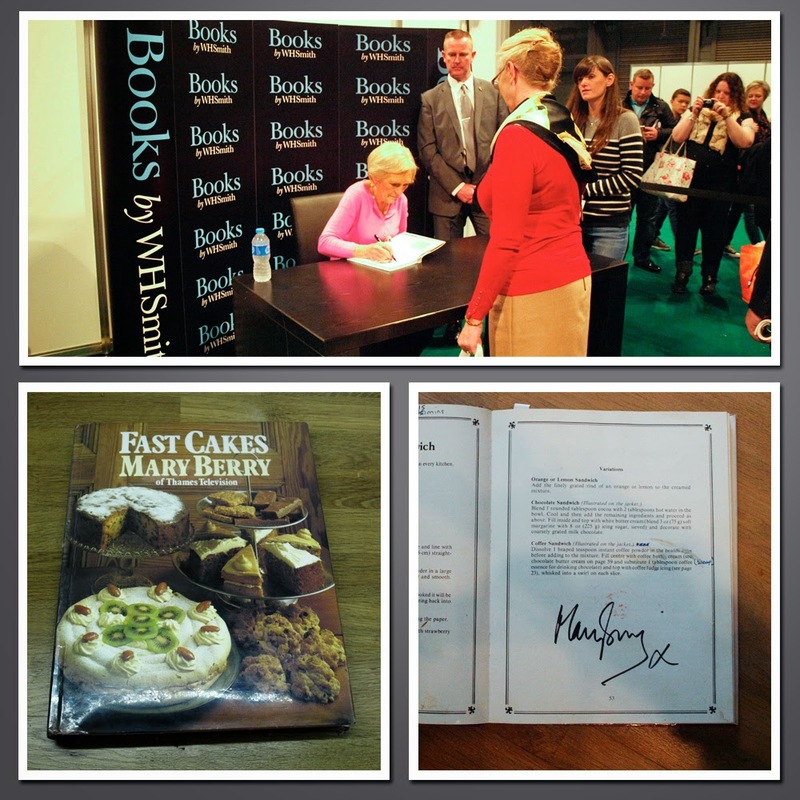 We enjoyed it and I think it would be good to include in recipes. 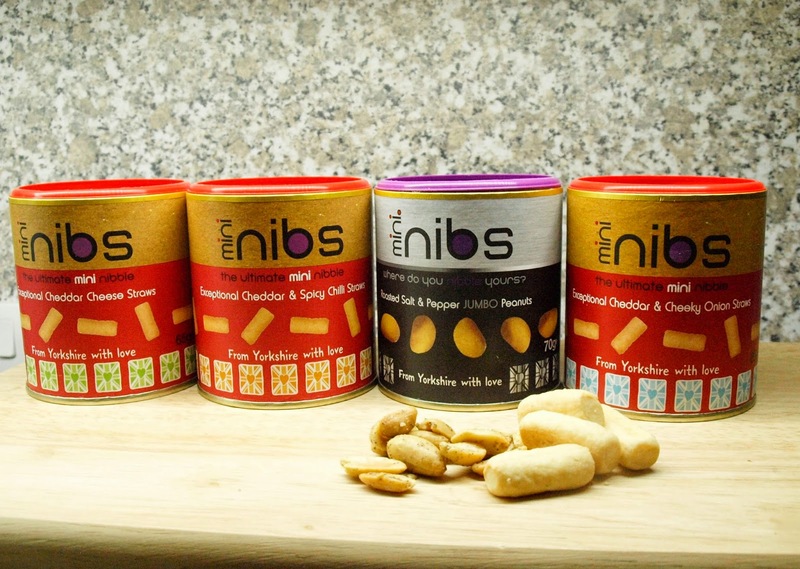 Mini Nibs are cheese straws created in North Yorkshire from quality ingredients, winners of Great Taste Award in 2013 and of 'deliciouslyorkshire' awards 2013-14. Mini Nibs are crunchy cheesey biscuits for nibbling and then there is their risque cousin the Mini Nibs jumbo peanut. 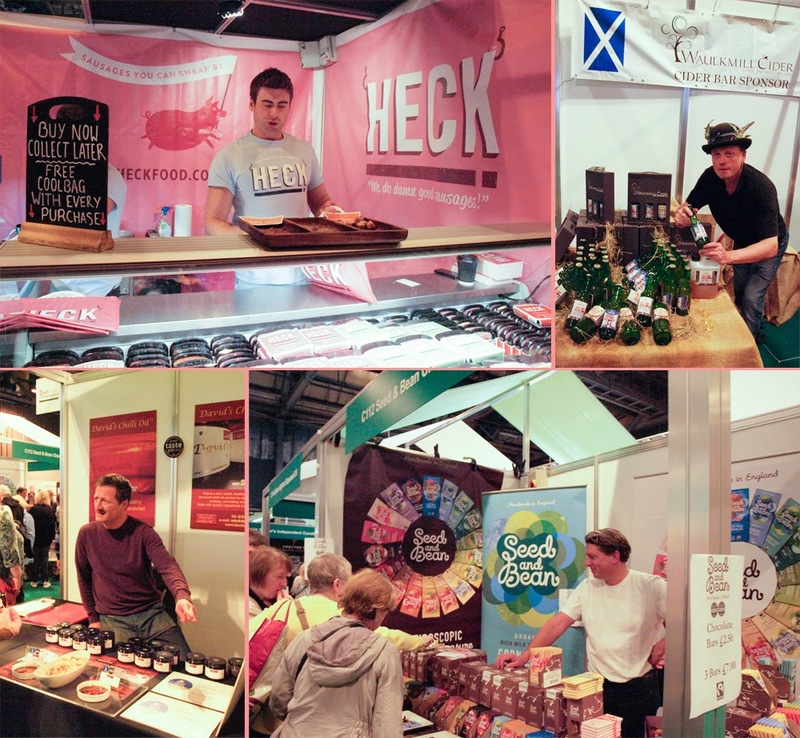 These snacks are created in North Yorkshire from quality ingredients, Nib Nibs were winners of a Great Taste Award in 2013 and of 'deliciouslyorkshire' awards 2013-14. The mini Nibs come in different flavours, I found the plain cheese mini nibs a bit of a non-event, but absolutely loved the Exceptional Cheddar and Spicy Chilli Straws, the Cheddar and Cheeky Onion Straws were also good. I think a few tubs of these should be in everyone's cupboard for the coming festive season, or maybe even before that. Oh yes, and the peanuts, nice chunky, roasted jumbo peanuts covered with salt and pepper, very tasty indeed. Everyone loves chips and I am no exception, however I am no fan of deep frying so McCain's Home Chips, which are baked in the oven, are my 'go to' chip every time. 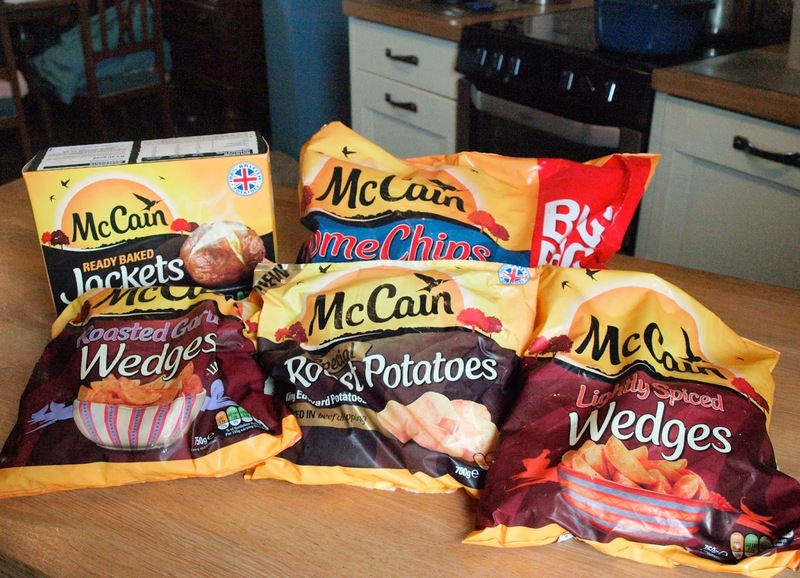 McCains make a wide range of frozen potato products, potato wedges comes with a variety of flavours and are fun to eat with dips or as an accompaniment to many different dishes. I like to eat wedges wtih pizza. I've waxed lyrical about frozen baked potatoes before, they really do have a baked flavour even though you are cooking them in the microwave, McCain's Ready Baked Jackets ready in a few minutes making it easy to have a healthy filler. McCain's Roast Potatoes will always be crispy on the outside and fluffy inside and so convenient. Kids love Potato Waffles, Smiles and Mini Jackets. Thanks to all of the companies who provided me with samples to review. I was not paid for these reviews and all opinions are my own. Pupils from Royal Mile Primary in Edinburgh today (Wednesday 29 October) accompanied Cabinet Secretary for Culture and External Affairs, Fiona Hyslop in launching St Andrew’s Day Out 2014, encouraging Scots and visitors to Scotland to take advantage of the wealth of events and offers available across November to celebrate St Andrew’s Day. P4 pupils Sophie Martin (chef), Angelina Wood (skier), Siaka Jateh (golfer) and Erkan Gullupinar (surfer), all aged eight, got into the spirit of the celebrations, dressed to represent the vast range of activities on offer across Scotland - from food and drink events and surfing lessons to skiing experiences and mini golf – all to mark our national day on 30 November. Over 200 participating attractions across the country are offering 2 for 1, kids go free or free entry, presenting a huge variety of fun days out to suit every taste. Culture vultures can enjoy visiting House for an Art Lover in Glasgow and the latest exhibits at the National Museum of Scotland in Edinburgh, while outdoor enthusiasts can take in the best of Scotland’s scenery at the Nevis Range, explore the countryside with Segway tours in Dumfries or go Nessie hunting at the Loch Ness Centre. Budding scientists can investigate the cosmos at Satrosphere, Aberdeen or learn about the world underwater at Macduff Marine Aquarium. 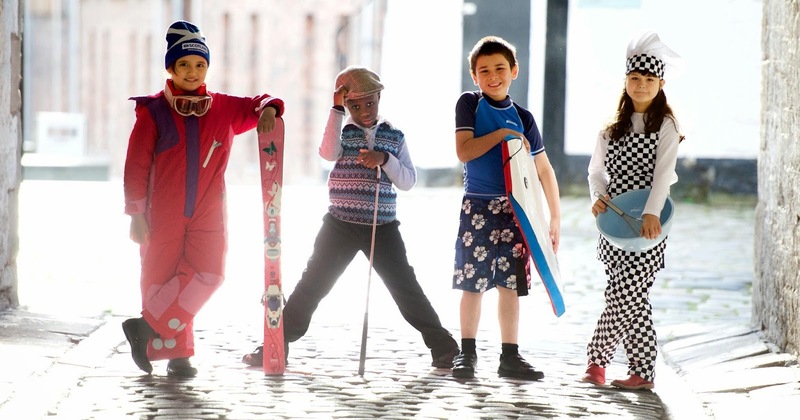 In addition to over 200 attractions in Scotland running discounted offers, there are a variety of St Andrew’s Day events taking place through the Scotland’s Winter Festivals programme, funded by the Scottish Government and delivered by EventScotland. After an action packed St Andrew’s Day Out, what better way to carry on the celebrations than with a St Andrew’s Night In - dining on the quality produce that Scotland has to offer. Look out for more information about St Andrew's Night In here at Farmersgirl Kitchen. 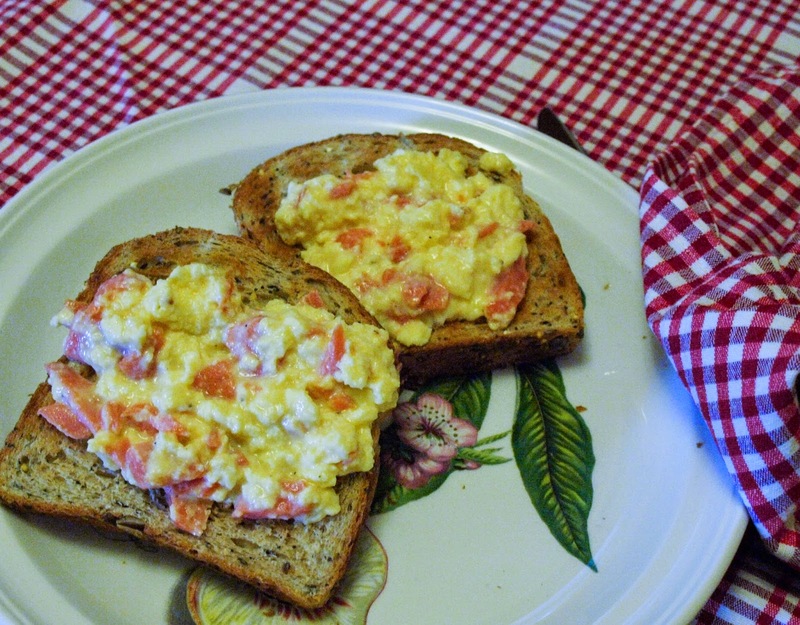 There are loads more fish recipes on the Fish is the Dish website. 1. Cut the trout fillets into 2 cm cubes. 2. Mix the oil and balsamic together, either shake in a jar or mix with a whisk, just like making salad dressing. Pour the mixture over the trout and leave in the fridge for a couple of hours. 3. Remove the trout from the fridge. 4. Stretch the bacon rashers with the back of a blunt knife and then cut each in half. 5. 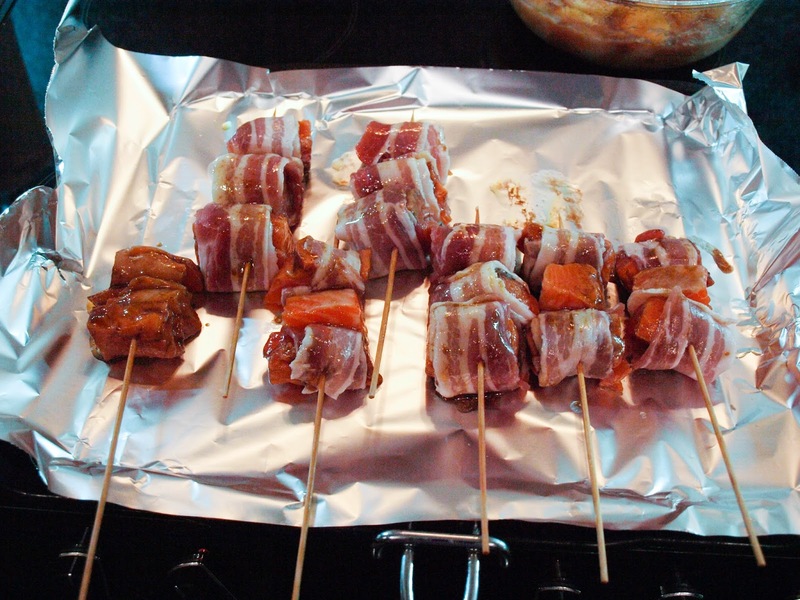 Wrap each chunk of trout in half a bacon rasher and push onto a skewer. 6. 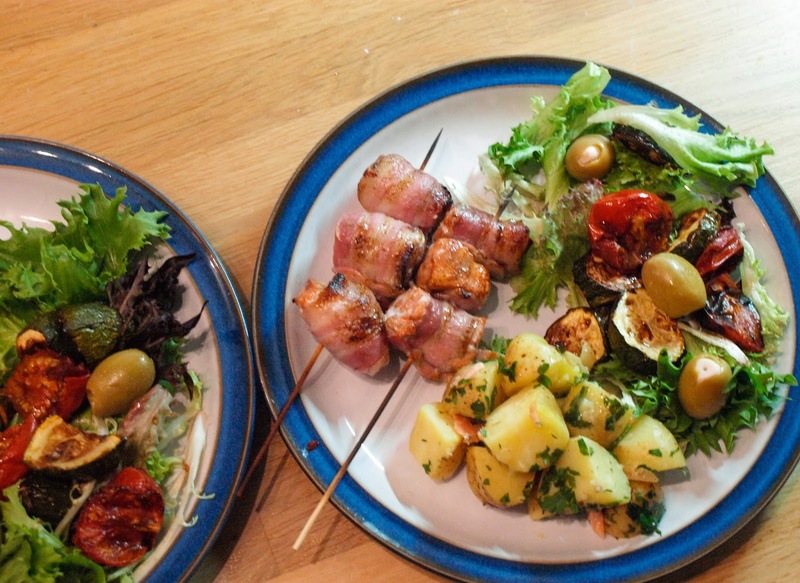 Line your grill pan with foil and line up your kebabs. 7. Grill until the bacon is cooked and crispy, you can be guaranteed that the fish will be cooked inside. 8. Serve with roasted vegetables and salad. 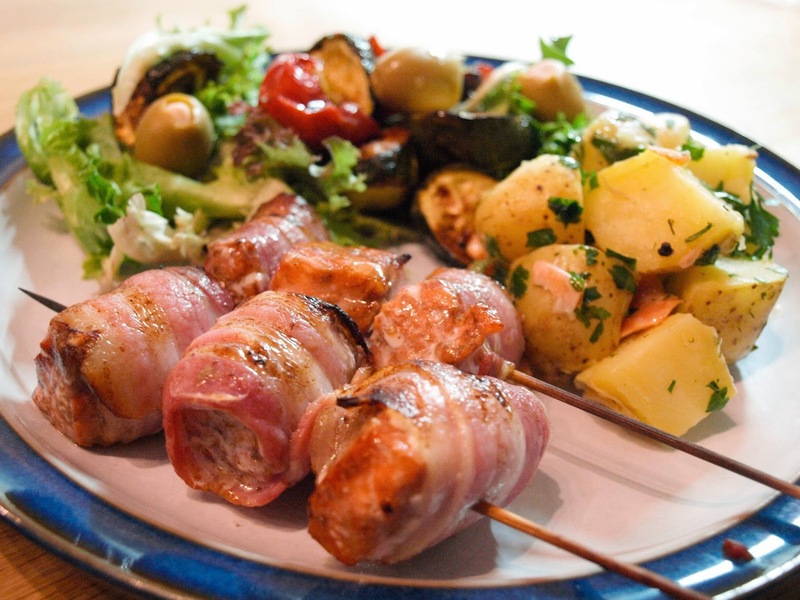 These kebabs would work well on a barbecue, griddle pan or electric grilling machine. 1. Cook the potatoes in boiling water until just tender, drain and place in a large bowl or dish. 2. Make the dressing by adding the lemon juice and olive oil to the dill dressing and mix. 3. Add to the potatoes and mix well. 4. 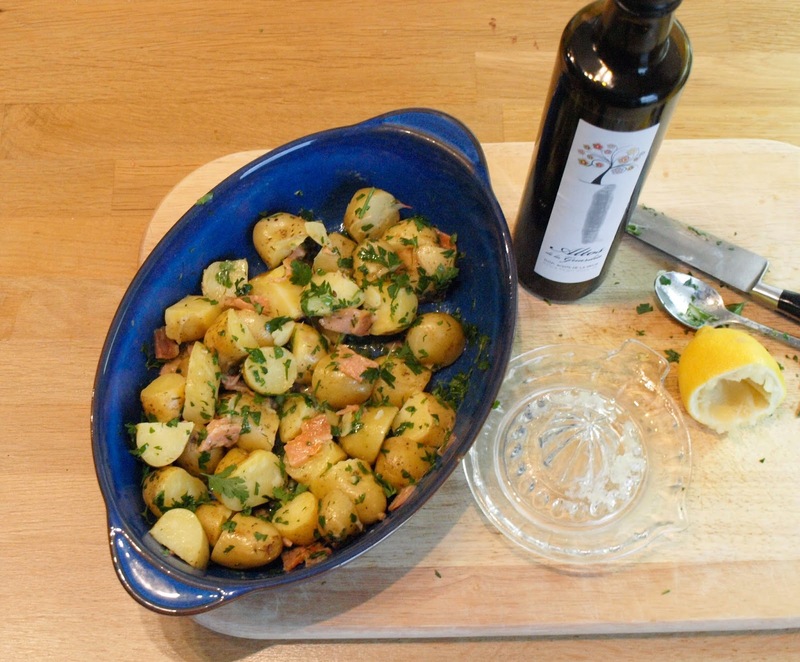 Cut the Gravadlax in to small pieces and add to the potato salad with the finely chopped parsley. 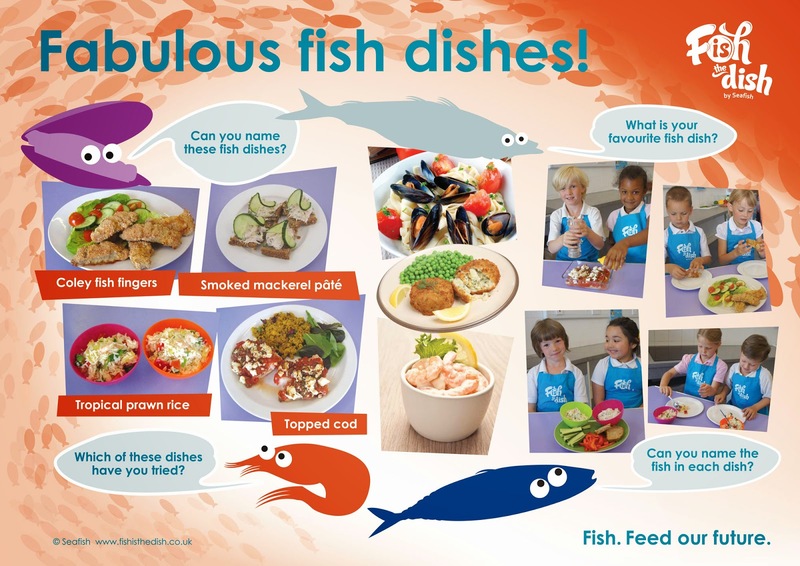 Fish is great for kids too, there are lots of fun dishes you can make with your children on the Fish is the Dish website too. As my regular readers know, I am slightly obsessed with my slow cooker and use it pretty much every week to make all kinds of slowly cooked recipes. There are many different brands of slow cooker but the original Crock-pot is still has a certain cachet, if slow cookers have cachet! 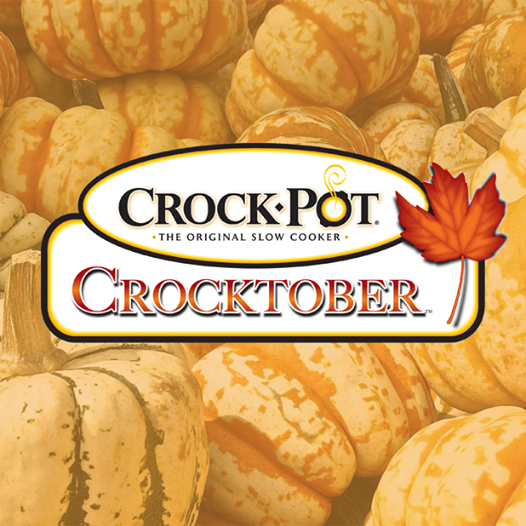 I was delighted to be invited by Crock-pot to try out the Crock-pot Countdown Slow Cooker join them making some recipes for Crocktober over on their Facebook page. My sister-in-law gave me a jar of preserved lemons that she had made and everytime I open the larder I see them there, so it seemed like the ideal opportunity to make a Tagine in the Crock-pot. 1. Soak the saffron in the hot stock to bring out the colour. 3. Cook the onion until it starts to become transparent. 4. Add the garlic, ras el hanout, ginger coriander and cinnamon stick and cook for a minute. 5. Add the stock and bring to the boil, add to the Crock-pot and cook on Low for 5 hours. 6. Add the chickpeas, the olives and the preserved lemons, roughly chopped. 7. Cook on Low for a further 1-2 hours. 8. Check the seasoning and adjust to taste. If you are not ready to eat, the Crock-pot will keep the Tagine warm for a couple of hours without coming to any harm. Serve with couscous, I added some sultanas to the cous cous and used some of the juices from the Tagine, with some added boiling water, to swell the grains. 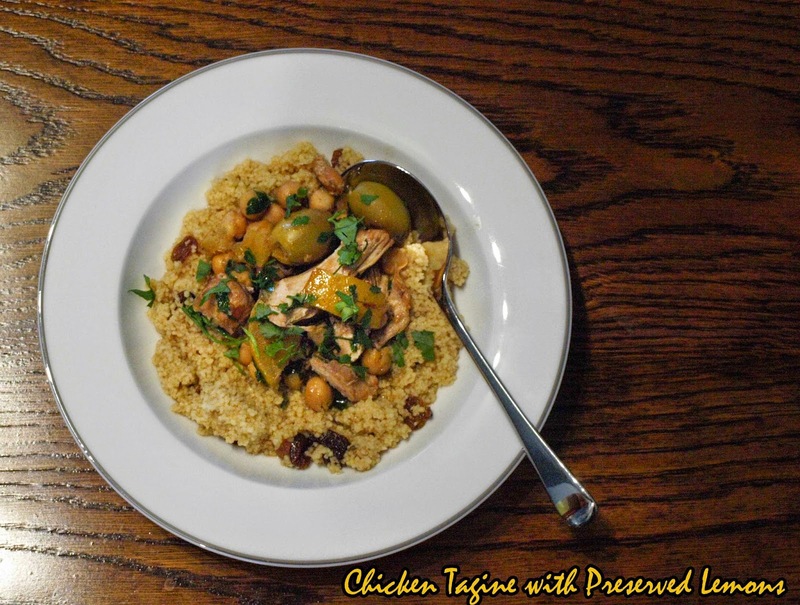 The Tagine was much lighter than the usual lamb recipe that I make, I missed the sweetness of dried fruit in the dish, which was why I added sultanas to the couscous. 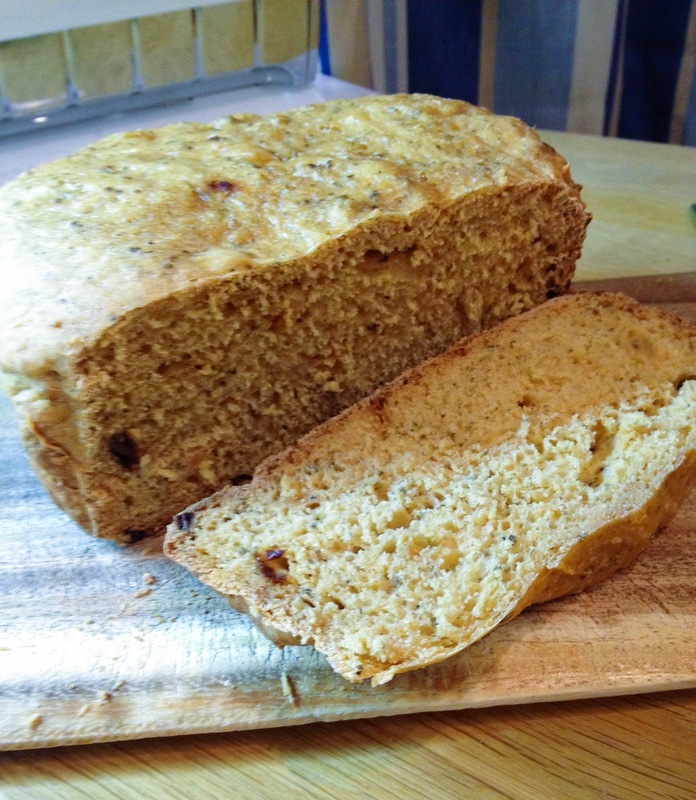 I would probably add some dates or apricots if I was making it again. I would recommend that you don't add any salt to the dish while cooking as I found that the preserved lemons (preserved in salt or brine) and the olives added enough salt without any additions. So how did the Crock-pot perform? The 'stay warm' feature is really valuable as you know that if you are a little later getting home, your meal will be kept warm without being over cooked. My other slow cooker has a metal 'pot' which can go on the hob, I did miss that but not as much as I thought I would. The electronic timer means that you can be accurate with your timings. Best of all for me, the Crock-pot bowl and lid can go in the dishwasher - woo hoo! 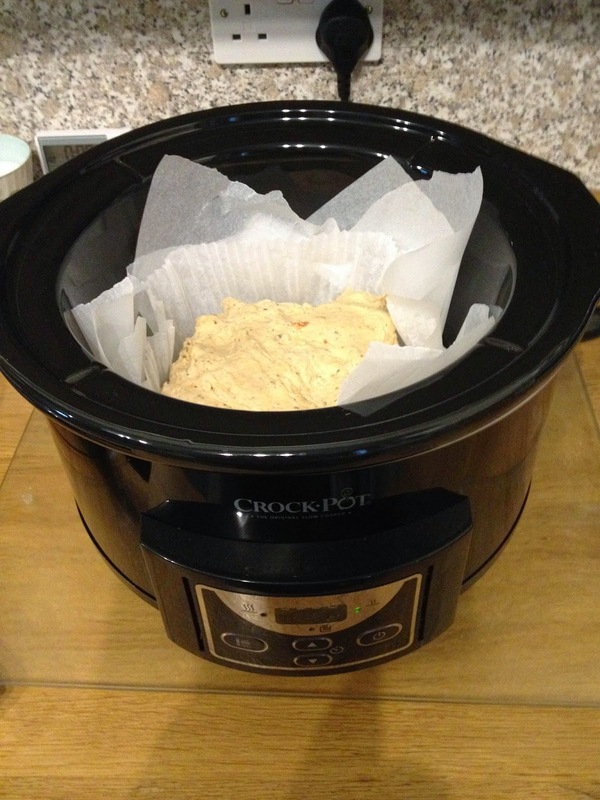 If you would like to try to win a Countdown Slow Cooker Crockpot and Crockpot Warmer (I'll tell you about the Crockpot Warmer in another post) my friend Karen is running a giveaway over at her blog Lavender and Lovage - Crockpot Slow Cooker and Crockpot Warmer Giveaway ending 9th December 2014. 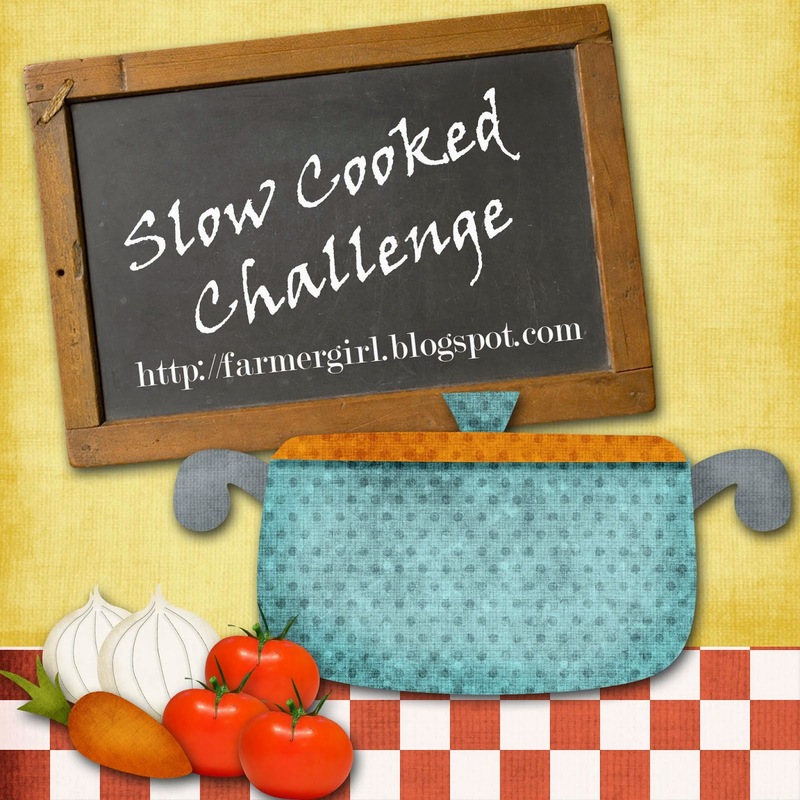 I'm adding this to my own Slow Cooked Challenge, anyone is welcome to join in with a slowly cooked recipe whether in a slow cooker or by other slow cooking method. Thanks to the people at Crock-pot for providing me with this Countdown Slow Cooker Crock-pot, I was not paid for this review and all opinions are my own. I do love smoked mackerel. It's such versatile fish, you can eat it cold with salad, whizz it up with creme fraiche to make a Mackerel Pate or serve on toast in a Mackerel Sun Dried Tomato and Cheese Toast or add it to all sorts of different dishes. 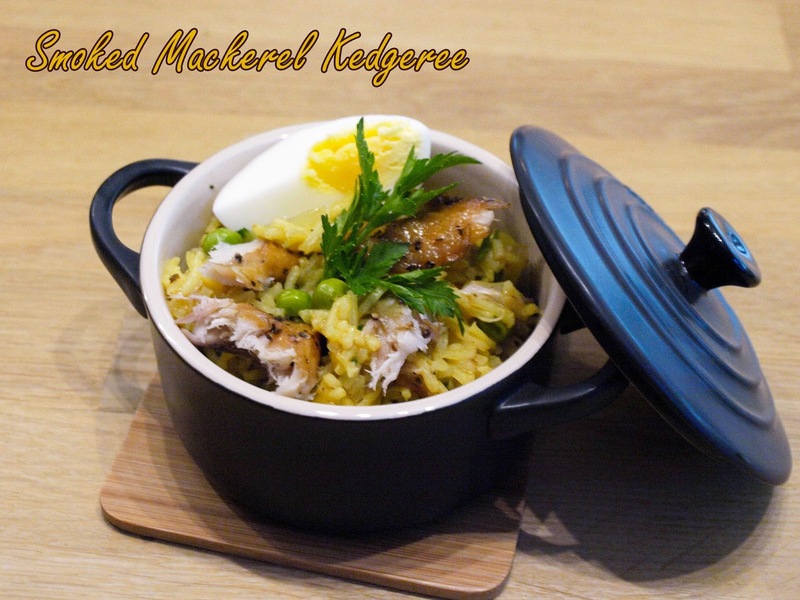 I also have a soft spot for kedgeree, my mum used to make it with leftover rice and cooked smoked haddock. The whole lot was re-fried in butter and was so luscious and fun with the added sweetness of peas and topped with hard boiled eggs. My recipe does include a little curry flavouring it takes about 20 minutes to make and was a perfect Friday night supper. 1. Heat the oil in a large pan, add the garlic and onion and cook until soft. 2. Add the rice and stir around till covered in oil, add the korma paste and cook for a minute. 3. Add the stock or water and simmer until the rice is soft and all the liquid has been absorbed, about 10 minutes, add the peas. 4. Flake the smoked mackerel and add to the cooked rice, season to taste. 5. Finish by adding the chopped parsley and quartered hard boiled eggs. 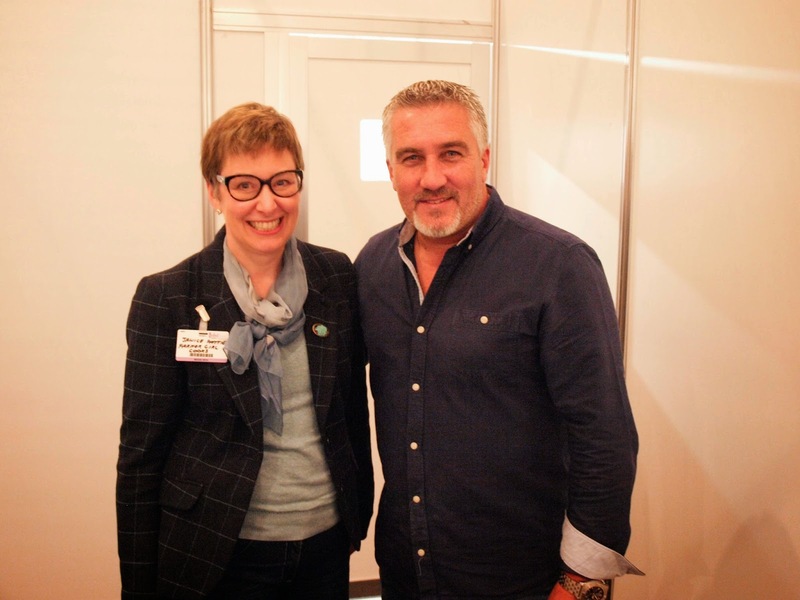 I'm entering this for Credit Crunch Munch, the thrifty blog challenge run by Helen at Fuss Free Flavours and Camilla at Fab Food 4 All, this month the challenge is being hosted at A New Addition. I feel that this dish qualifies because smoked mackerel is really good value as well as being really good for you, read about the health benefits of oily fish at Fish is the Dish. 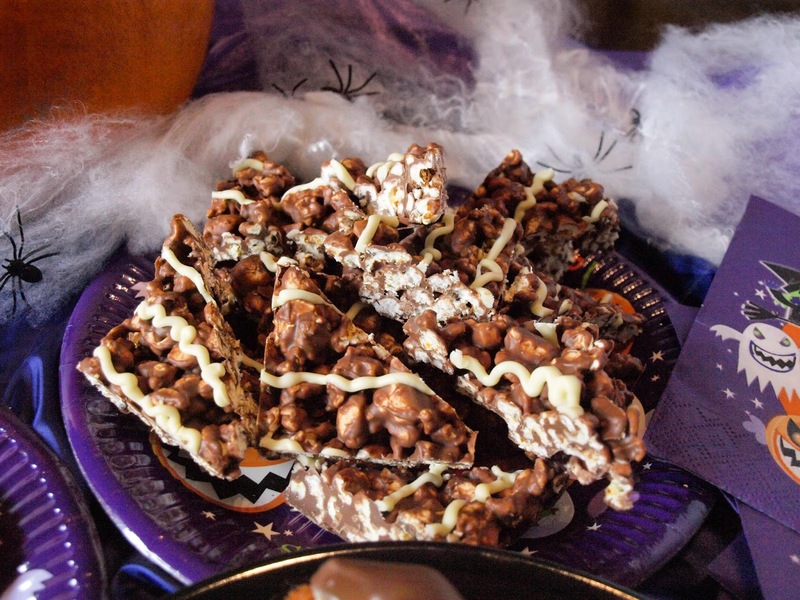 Food is such an integral part of every festival and Halloween is no exception. My memories of Halloween feature the Brownie Guide Fancy Dress Party for which we all had to carve a 'Turnip' lantern. 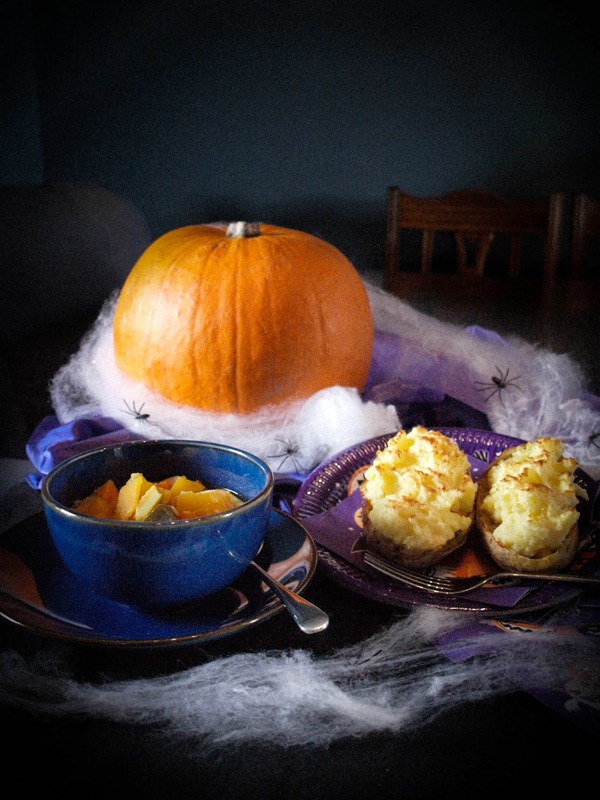 There were no pumpkins in 1960s Scotland, so we used turnips/swedes, it was really hard work carving them and many a spoon was bent in the process. At the party there would be large dishes of buttery mashed potato and others of peppery, mashed 'neeps' the inside of those turnip lanterns cooked and mashed! We also had 'Treacle Scones', girdle scones dangling on strings that you had to try to take a bite from as someone swung the string so you got covered in sticky treacle. That was soon washed off with the 'Dookin' for Apples', the only way to be sure of getting your apple was to stick your head right down to the bottom of the bowl and bite hard into the apple, you got soaked but it worked. I always hated it when, at some parties, they made you drop forks into the bowl, it was not nearly as effective. There were none of the fancy themed sweets and cakes to be bought in the shops, but I think it is much more fun to make your Halloween treats at home. Chocolate Popcorn Triangles are a really fun and simple treat to make with your kids, you don't really need a recipe, just melt some chocolate in a bowl over a pan of just simmering water and add ready made popcorn until it is all covered in chocolate, then press it into a brownie pan lined with non stick paper and place in the fridge until set. I decorated mine with some lines of white chocolate. I have a neat little trick for melting chocolate for piping (see below). 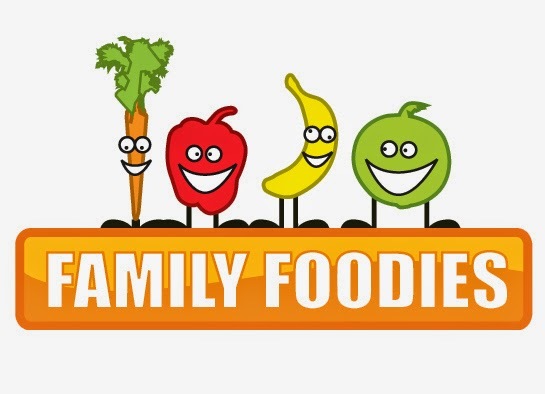 I'm entering the Chocolate Popcorn Triangles for Family Foodies the blogger challenge run by Eat your Veg and Bangers and Mash, as they are really easy to make with little ones. All you do it put your chocolate, I used Hadleigh Maid white chocolate buttons, into a disposable piping bag, pop it in the microwave for 30 seconds or until the chocolate has melted, then snip off the end of the bag and pipe lines over the chocolate popcorn in lines. Leave to set in the fridge again, then once set, cut into squares or triangles. I coloured white chocolate with orange food colouring to make the pumkin colour and it wasn't too difficult to make the two coloured witchy pumpkin with milk chocolate for the hat. 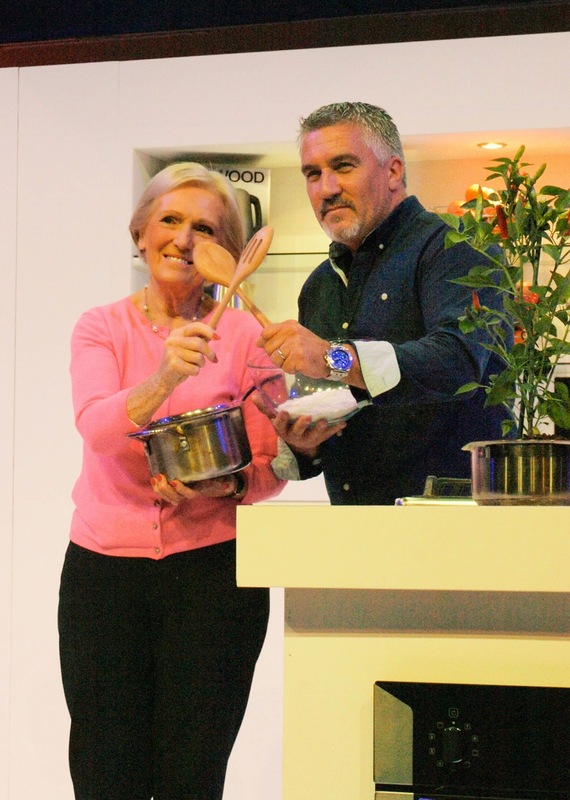 Leave the cakes to cook and then unmould. 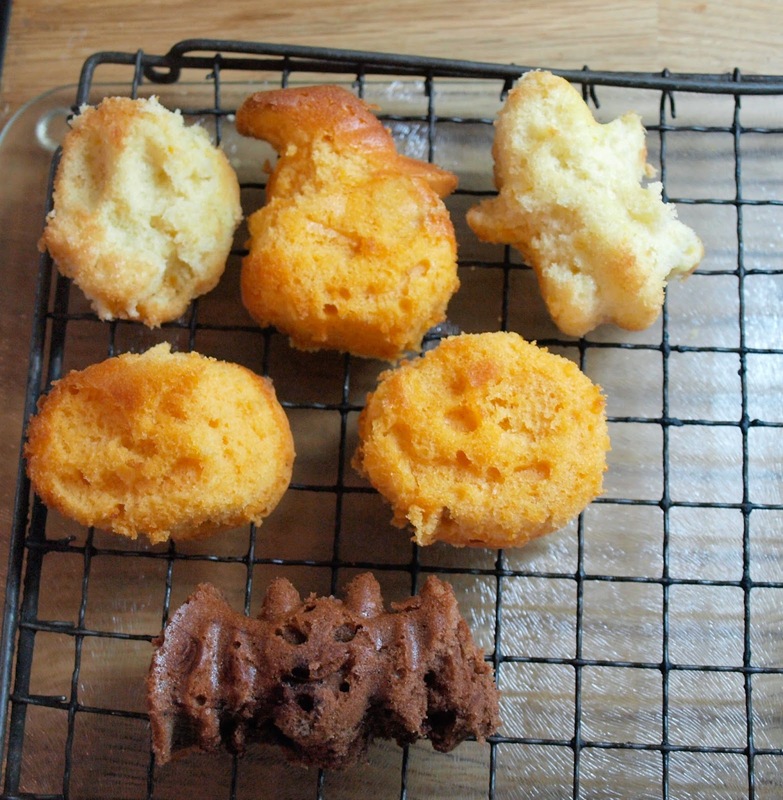 The shapes don't come out too well with the soft sponge cake but they are the perfect shape to top with the chocolate shapes. It's not just sweet treats that are needed at Halloween. You need something warm to eat before going out trick or treating. 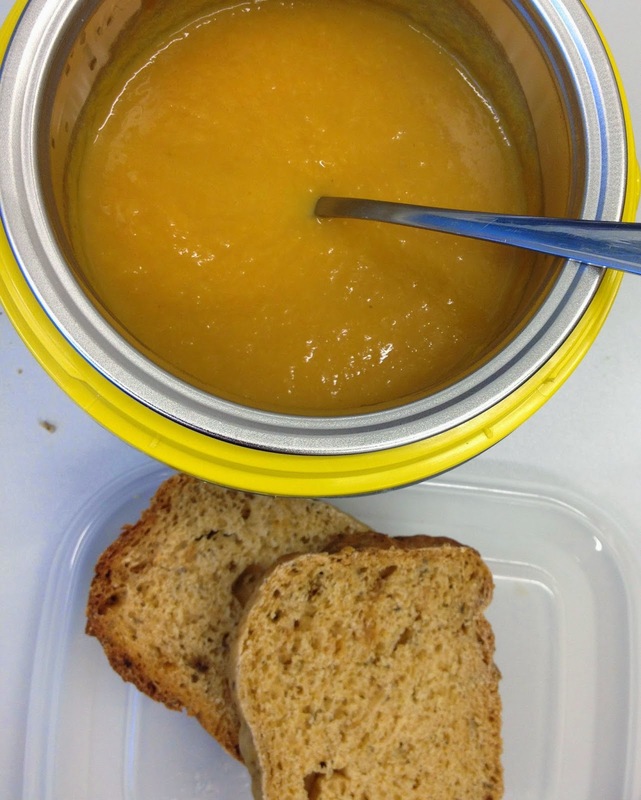 Knorr have some great recipes which will hit the spot, how about a bowl of warming Pumpkin and Butterbean Broth from a recipe created by Marco Pierre White? 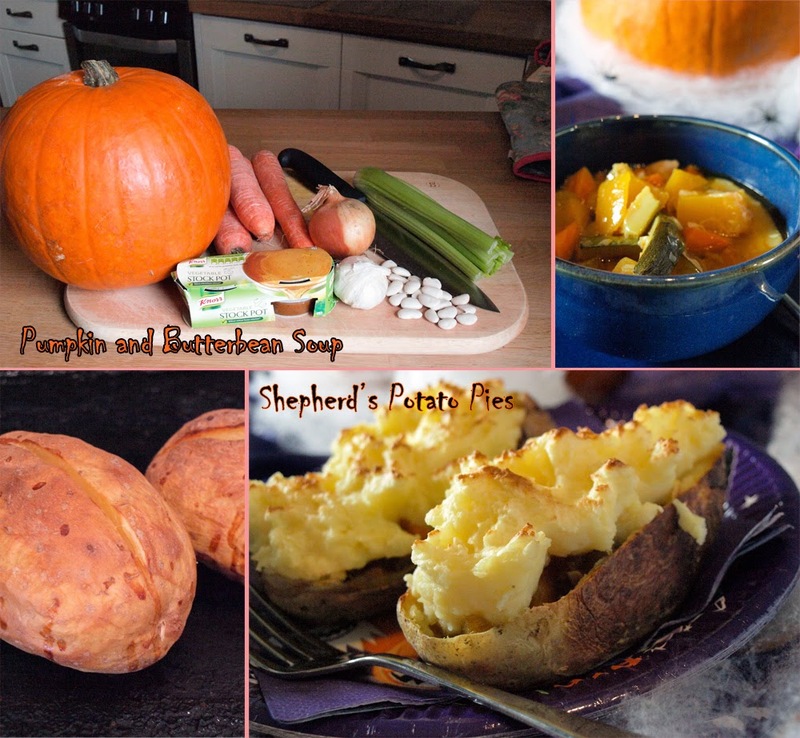 Or the perfect individual 'Sheperd's Pie-tatoes' a variation on Marco's Shepherd's Pie. 1. Heat the olive oil in a large casserole dish. Add in the onion and garlic and fry, stirring, for 2–3 minutes until lightly coloured. 3. Once the water has been cooked off, the lamb should crackle as the fat renders. Add the carrot and pumpkin and cook for 5 minutes. Add in the flour and work it in thoroughly. Season with Worcestershire sauce and mix in. Add in the Knorr Beef Stock Pot, pour in the water and add in the thyme. 7. Bake in the pre-heated oven for 30 minutes until a lovely golden-brown. Serve. 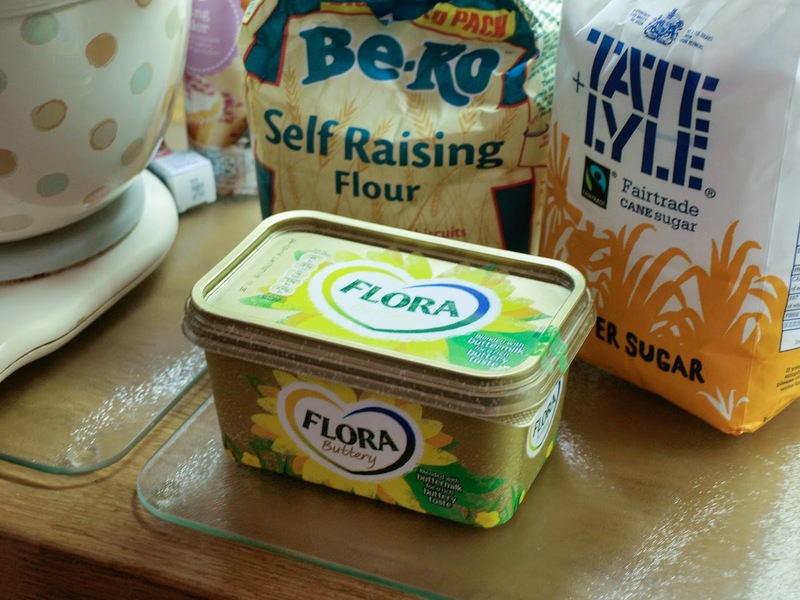 There are lot's more great recipes and cooking inspiration on the Knorr and Flora websites. 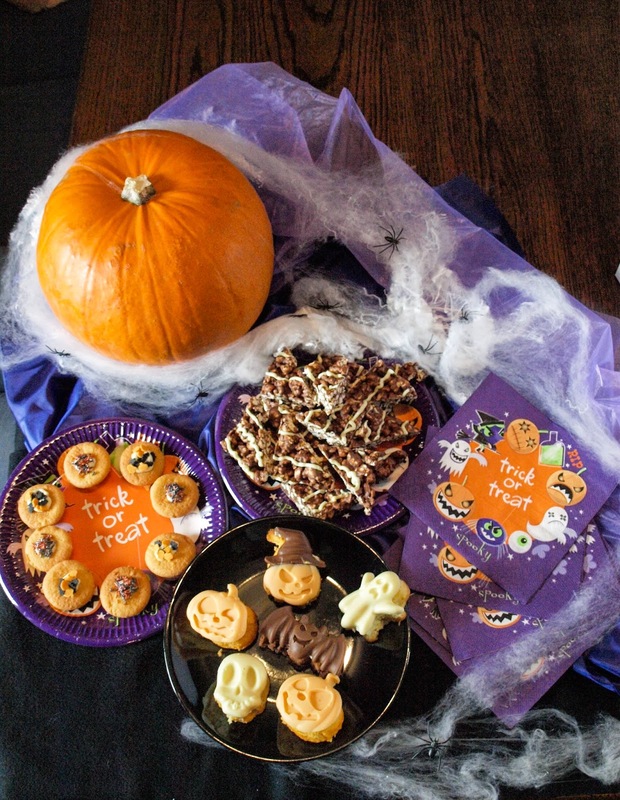 I was provided with a hamper of ingredients from Unilever/Knorr/Flora to make these Halloween Treats and Eats. I was not paid and all opinions are my own. Salmon isn't just for summer, it's one of the easiest fish to cook and very popular with the whole family all year round. Omega-3 also helps to significantly reduce the chances of cancer and heart disease and boosts sporting performance and concentration. 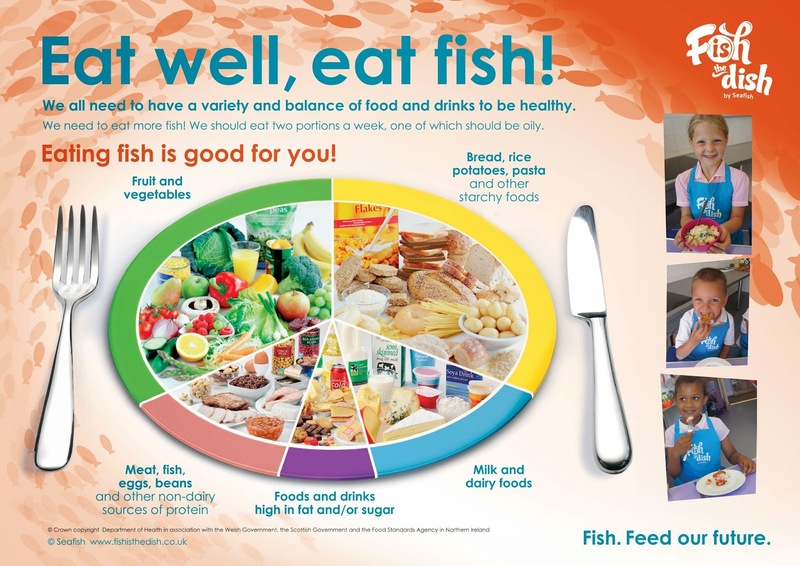 Seafood has long been recognised as the best dietary source of Omega-3. 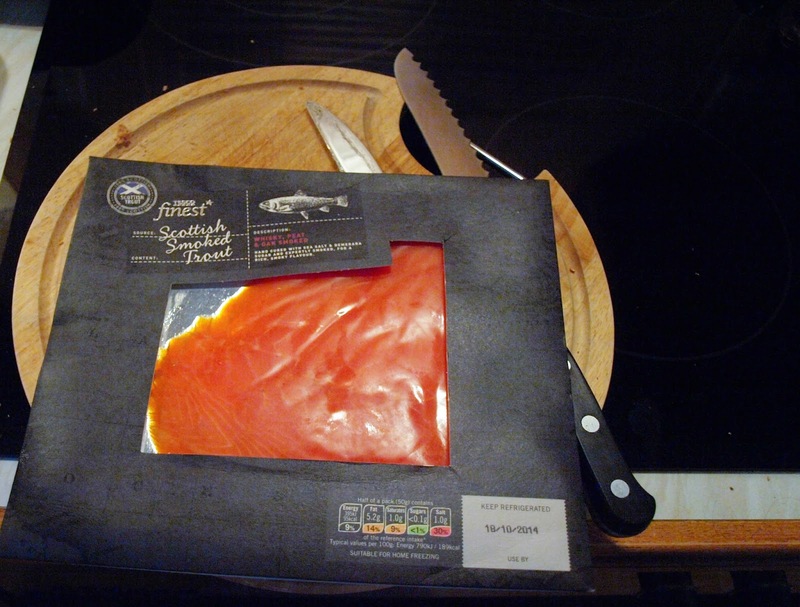 It's also a myth that fish is expensive, there are some really good deals in fish if you look out for them, I got this side of salmon for £10 and you could feed 6 adults generously which I think is a bit of a bargain. 1. Wash and the salmon and dry with kitchen paper. 2. 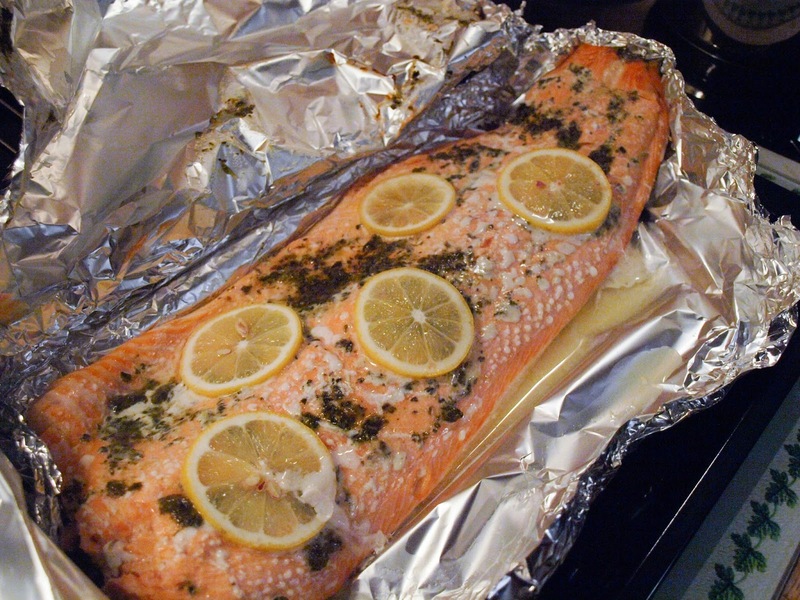 Line a baking tray with foil and place the salmon on top, brush the salmon with oil an sprinkle over the herbs, top with slices from half a lemon. 3. 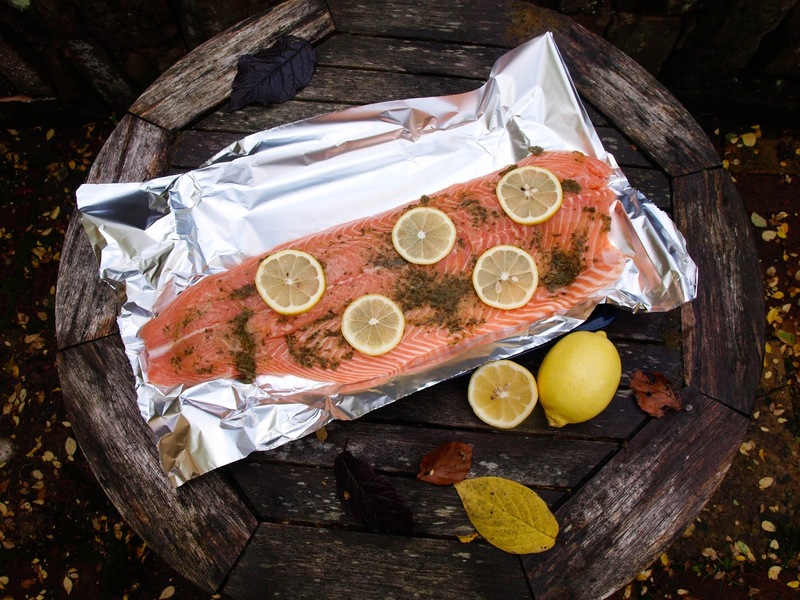 Lightly season, then cover with another sheet of foil and crimp around the edges so that the salmon is sealed in a foil parcel. 4. Bake in the oven at 160C for about 30 minutes until the salmon is opaque. 5. Serve with new potatoes and a green vegetable. This is a good recipe to prepare in the morning, stick in the fridge all parcelled up and then simply pre-heat the oven and pop it in. It will be ready in the time you have cooked the vegetables. 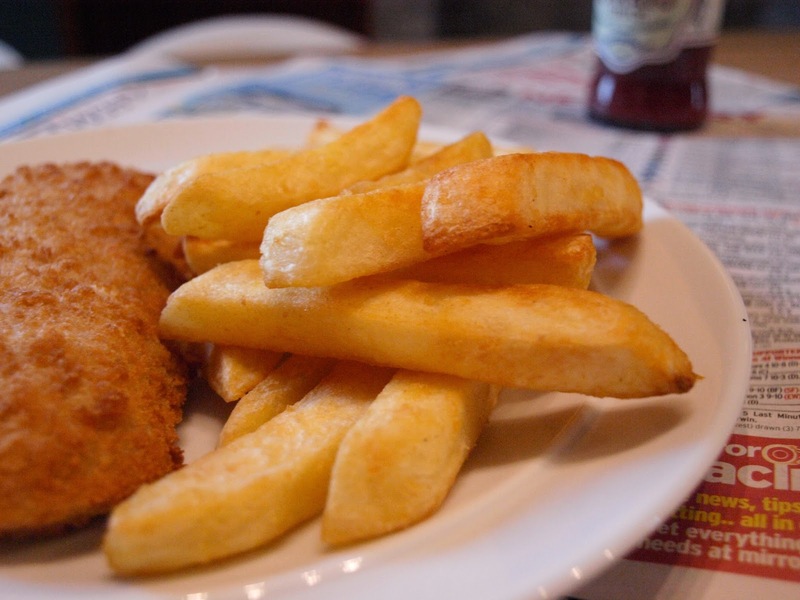 I'll be posting more fish recipes over the next four weeks as part of a campaign by Fish is the Dish to encourage the people of Britain to each more fish, watch out for them. 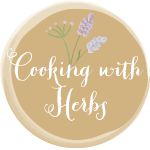 I'm entering this dish into the Cooking with Herbs challenge run by Karen at Lavender and Lovage, the theme this month is 'Scarborough Fair' as I have parsley and thyme in this dish it should fit the bill! 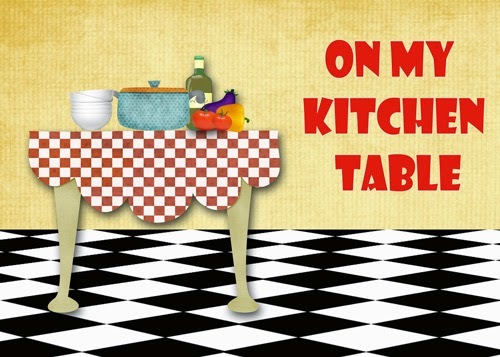 'Get out from that kitchen and rattle those pots and pans' - so says Bill Hayley in Shake, Rattle and Roll although how you are supposed to "roll my breakfast cos I'm a hungry man" if you get out from that kitchen, I have no idea. Maybe he was planning on taking whoever was in the kitchen OUT for breakfast. What do you think? No, I didn't think so either! I won't be rattling these lovely new Viners Hard Anodised pots and pans at all, Hard anodised cookware is twice as hard as stainless steel making it extremely durable, non-stick with a long lifespan and scratch resistance. I will be admiring the sleek lines and brushed steel finish of my pans, peeping through the clear lid to see how my recipes are progressing and shouting hurrah because those lids have a little hole in them for the steam to escape. My last pans didn't and I had to balance them on the handles causing water to condense on the inside and drip onto the hob. 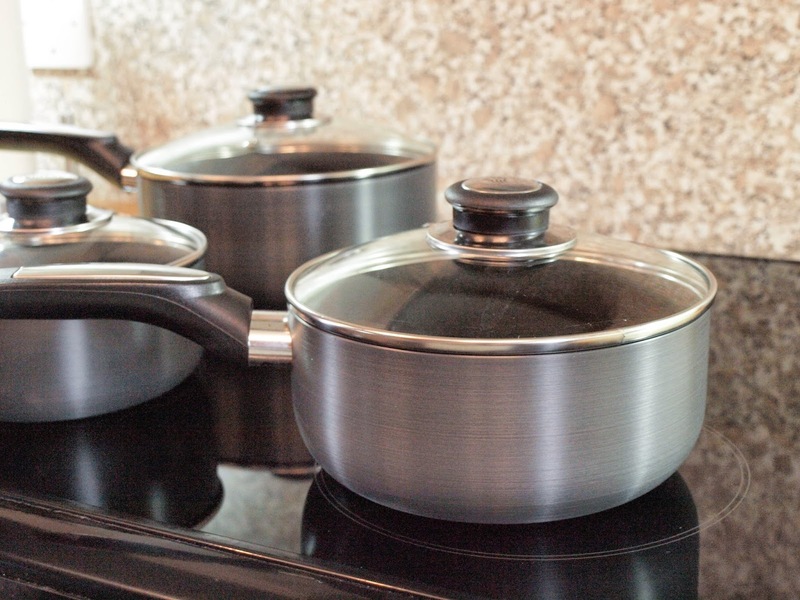 The lovely pans come from Viners, who I knew for their quality cutlery sets, but look a little closer and you will find that Viners Cook and Dine manufacture and distribute a wide range of cookware and tableware. Viners was once the biggest cutlery manufacturer in England and traces its roots back to Sheffield – the home to stainless steel – where in 1906 Willie and Emile Viener set the company up. The company specialized in electroplated silver products and used its expertise to expand into a variety of categories including tea sets, trays, fine cutlery and kitchen knives. Later on they used their manufacturing expertise to develop ranges of stainless steel products. Viners is not alone in the family, its sister brands include Mermaid and George Wilkinson bakeware which also boast a long and rich British heritage. Today, they have three factories in the U.K. with a tradition of over 180 years of manufacturing and employ nearly 300 people in order to bring a fine range of quality housewares to market and our set of trusted brands has grown to include largest manufacturer of glassware to the U.S. retail market – Anchor Hocking. The other great thing about Viners is that they have some really good deals. I've been signed up to their newsletter for some time and there are always lots of offers and deals on their products. 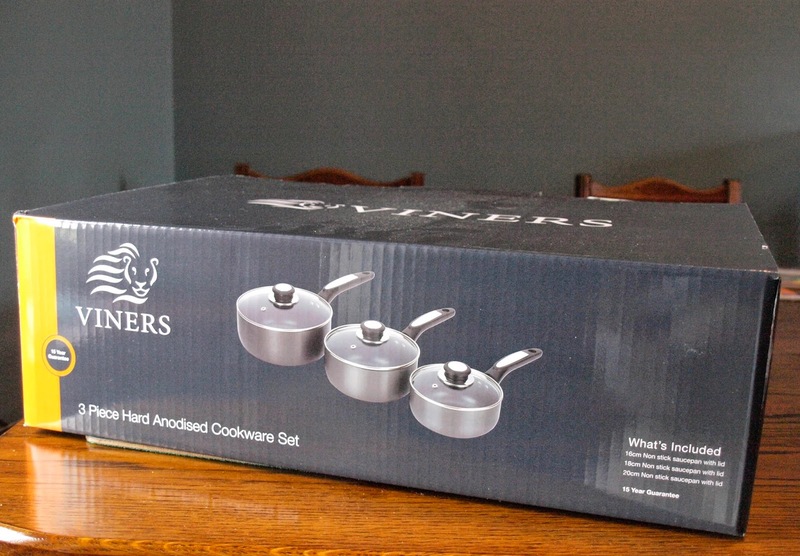 The High Street price for the Viners Hard Anodised 3 piece non-stick pan set is £100 but there is a deal of 55% off bringing them down to £45 (at time of publishing) which makes them really affordable. 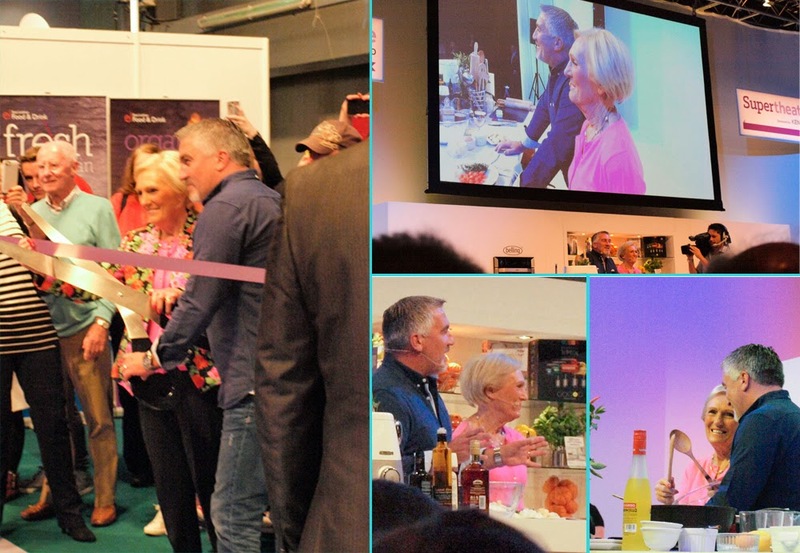 You can follow Viners on Facebook and Twitter too for news of their products and offers. 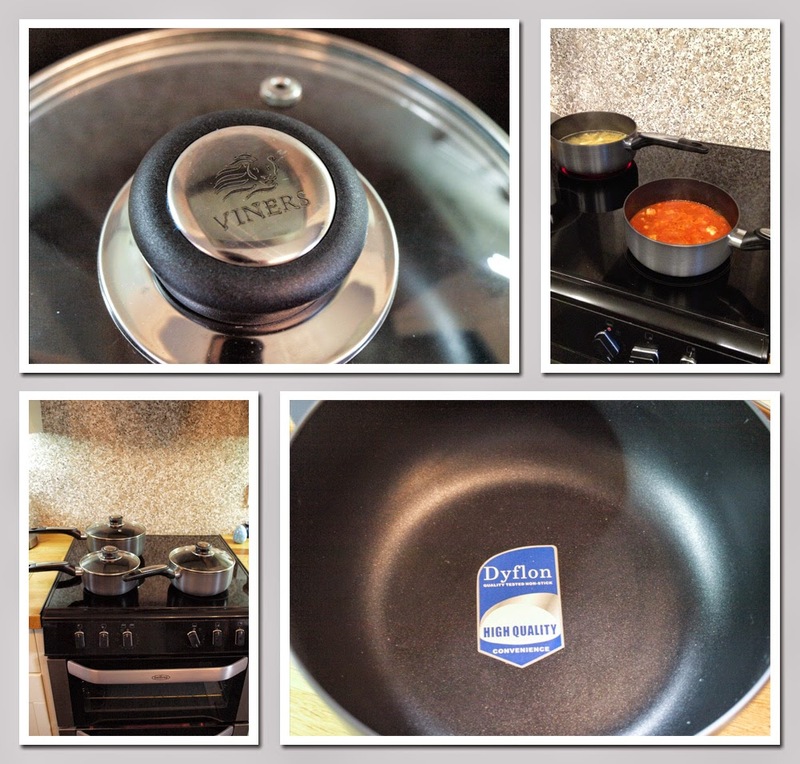 I was supplied with the non-stick pan set by Viners, I was not paid for this post and all opinions are my own.